(28th April Ipoh, Perak) Chinese girl achieved 11A + success in SPM, is one of Perak's top students, but was rejected by the Public Service (JPA) scholarship. Dream to study Electronic engineering abroad in Germany may be destroyed. 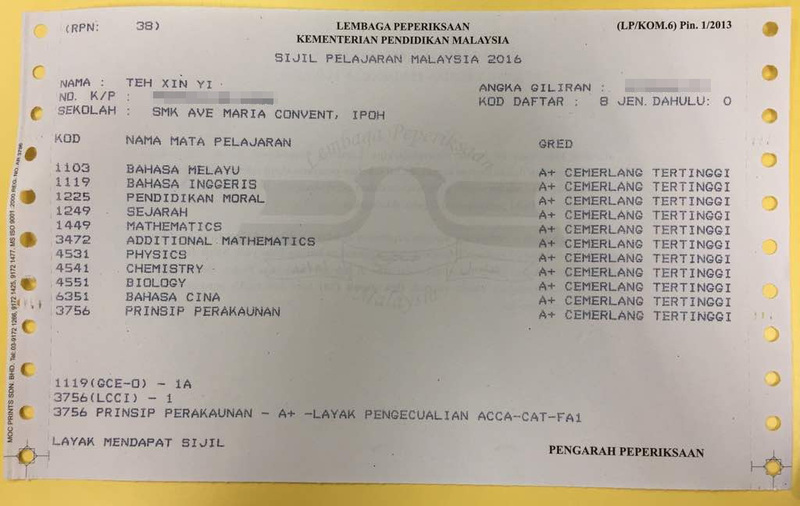 Zheng Xinyi from the SMJK Ave Maria Convent who achieved straight A+ in the 2016 SPM, including self-study subjects, is the only student in the school that scored 11A+. She hopes to get scholarships for further study abroad to achieve her dream of becoming an engineer. She was pleased to apply for the JPA Scholarship Program, including the National Scholarship Program (PPN) and Japan, South Korea, France and Germany Special Program (JKPJ), but she and her family was disappointed with the result. 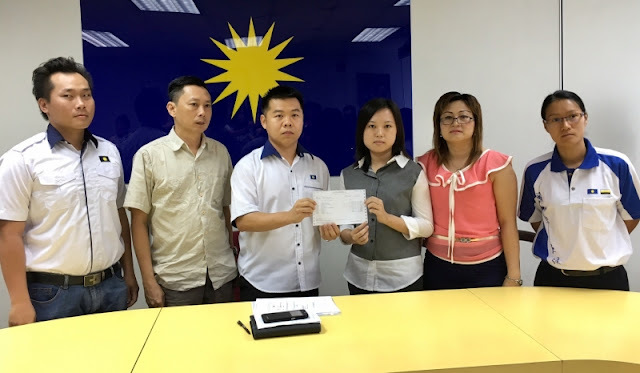 Zheng Xinyi and his parents Zheng Guijian (48 years old, technician) and Wen Huijuan (46 years old, clerical) with the companion of the head of MCA Belia Ipoh West, Liu Guonan, held a press conference. She was born in a middle-class family, home still has three Sister and grandparents, as the eldest daughter, she is eager to receive a scholarship to reduce the economic burden of parents. She has been active in extracurricular activities and has won awards in a number of national competitions, including the National Music Competition (Champion), the Malaysian Carnival Carnival (Group Champion), the National Chemistry Test (Excellence Award), Taichi society, AJK of Chinese Orchestra and Sinchew Daily student journalist. She said that she was informed by the official website on April 26 that the scholarship application has failed, which she has then appealed to the authorities, but on the other side, the "P9A bursary" program submission deadline in on May 22. She worries that the result of the appeal can not be released before this deadline. She said that she did not know whether the result of the appeal could be released within 20 days because if she accepts the "P9A Sponsorship" program, she would abandon the opportunity to study abroad, which is always her dream. Asked if she failed the appeal, what was the worst plan, she said she would stay at the UTP in Electronic Engineering. Wen Huijuan said that her daughter achieve full A in the junior high school assessment test (PT3) and small six assessment exam (UPSR), moreover this SPM which she took 2 extra subjects was her best performance, she want to get the JPA scholarship to overseas study, if she only awarded "P9A bursary" program, what is the difference between she and the other 9A + students? "Her daughter is a science student but chose to take Chinese and Accounting subject, which accounting is also her self-study subject. In order to go to Germany for further study, she did a lot of hard work. Liu Guonan said that the National Scholarship Program sponsored 20 top students to study in the top ten universities in the world, in addition, Japan, South Korea, France and Germany special program is sponsored to 200 special students in the engineering field. He said that the total number of 220 outstanding students will receive the above sponsorships, but in the 2016 SPM, A+ candidates are only 102 or 1.94%, so it is difficult to understand why Zheng Xinyi is not offered a place in the scholarships. He urged the applicant to appeal at the latest on May 2, and then arrange a copy of the submission, as he will assist and follow-up one by one, and forward them to the MCA ministers. Identical incidents like this one happen every single year around April and May after the SPM result releases and JPA scholarship application closes. It has happened annually and will continue to happen in the future that it is no longer newsworthy to those of us that read this again and again. It is always casted as a non-bumiputera issue and get assisted by MCA or MIC reported mostly in Chinese, Tamil and sometimes English news media outlets. Potential political publicity gain aside, it is extremely troubling that the brightest minds in the country denied the best government sponsored education opportunities overseas simply on the basis of race. One practical advice to those SPM candidates aiming to get JPA scholarships: don't put all your eggs in one basket. Make sure you apply many prestigious scholarships from different public and public providers even if you score straight A+'s.